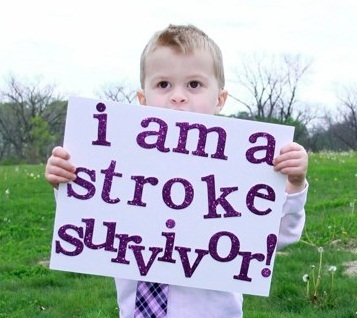 Pediatric Stroke Awareness – Everything you need to get started! – Click here for Fact Sheet, Awareness Month Ideas, How to Host a Pediatric Stroke Event, How to Share Your Child’s Story, Proclamations , Videos, and more. Learn more about Pediatric Stroke Awareness and what you can do to share our message that Kids Have Strokes, too. Stroke can occur before birth, in infants, children and young adults. Risk of stroke is highest in the first year of life and peaks during the perinatal period (a few weeks before and after birth). Perinatal arterial ischemic stroke is the most common form of stroke in children. You may also hear terms like fetal stroke, prenatal stroke, and in utero stroke. Your doctor may refer to a stroke that occurs between birth and one month of age as a neonatal stroke. Sixty percent of infants with a stroke diagnosis have specific symptoms such as recurrent focal seizures in the first three days of life. Their stroke will most likely be identified early. However, forty percent of infants with early stroke do not have symptoms and the stroke is recognized later with delays in movement, development, learning, or seizures. The risk of stroke from birth through age 19 is approximately 5 per 100,000 children. Perinatal, neonatal, infant and childhood stroke are some of the most common causes of hemiplegia, hemiparesis, or hemiplegic cerebral palsy in children. Sixty percent of the children who survive a stroke will have permanent neurological problems. We’re sad to report that stroke is one of the top 10 causes of death in children between the ages of 1 and 19 years. A child who favors one hand, leaves the other hand in a fist or doesn’t bring both hands together during play needs to be referred to an early intervention program and a pediatric neurologist for further testing. Delays in early milestones – rolling, sitting, pulling to stand, crawling, and walking – are additional reasons for evaluation. A child with early stroke may be unwilling to bear weight on one leg or may point the toes on that foot or walk on tip toe. The stroke diagnosis is confirmed with ultrasounds and MRI. Children often receive occupational and physical therapies for decades to help them learn functional skills of daily living and increase movement if they’re experiencing motor difficulties. Children with epilepsy usually take medication to stop or reduce seizure activity. Special educational programs may address learning and behavioral differences. The following organizations provide support to families of pediatric stroke survivors. Agrawal N, Johnston C, Wu Y, et al. Imaging Data Reveal a Higher Pediatric Stroke Incidence Than Prior U.S. Estimates. Stroke. 2009; 40:3415-3421. Amlie-Ledfond C, Sebire G, Fullerton HJ. Recent developments in childhood arterial ischemic stroke. Lancet Neurol. 2008;7: 425. 6 deVeber G, Roach ES, Riela AR, Wiznitzer M. Stroke in Children: Recognition, Treatment, and Future Directions. Seminars in Pediatric Neurology. 2000;7: 309. Gardner MA, Hills NK, Sidney S, Fullerton HJ. The Direct Costof Pediatric Stroke in a Population-Based Cohort (abstract). Annals of Neurolog. 2008;64(suppl 12):S135. Go AS, et al. AHA Statistical Update, Heart Disease and Stroke Statistics – 2013, A Report from the American Heart Association. December 12, 2012. Kirton A, deVeber G. Cerebral Palsy Secondary to PerinatalIschemic Stroke. Clin Perinatol. 2006;33:367-386. Kleindorfer D, Khoury J, et al. Temporal trends in the incidence and case fatality of stroke in children and adolescents. J Child Neurol. 2006;21:415– 418. Lo W, Zamel K, Ponnappa K, et al. The cost of pediatric stroke care and rehabilitation. Stroke. 2008;33:161-65. Roach ES, Golomb MR, Adams R, et al. Management of Stroke in Infants and Children: A Scientific Statement From a Special Writing Group of the American Heart Association Stroke Council and the Council on Cardiovascular Disease in the Young. Stroke. 2008;39:2644-2691. Sofronas M, Ichord RN, Fullerton HJ, et al. Pediatric Stroke Initiatives and Preliminary Studies: What Is Known and What is Needed? Pediatr Neurol. 2006;34:442. Genetic Risk Factors for Perinatal Arterial Ischemic Stroke – The apolipoprotein E polymorphism may confer genetic susceptibility for perinatal arterial ischemic stroke. Larger population-based studies are required to confirm this finding. 2013. California. The Pediatric Stroke Outcome Measure – is an objective, disease-specific outcome measure containing 115 test items suitable for newborn to adult ages. The PSOM measures neurological deficit and function across 5 subscales. 2012. Canada. * This incidence is still likely to be an underestimate because it is based largely on retrospective cohort studies relying in part on administrative database search strategies, and does not include all cases of cerebral sinovenous thrombosis.